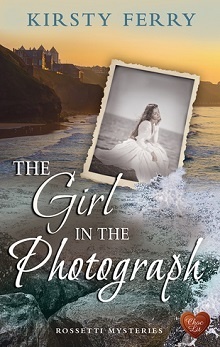 Kirsty Ferry comes to the blog today with the third book in The Rossetti Mysteries series, a lovely mix of romance, mystery and some ghosts from the past. Determined to study an artist’s colony active in Yorkshire at the turn of the century and coaxed in by her brother, Lissy has rented a cottage near Sea Scarr Hall to live in while she researches. Her own relationships have ended, and she’s free to pursue the mysteries and regain her own footing from her own troubled past. Prone to quick, not always fully informed decisions, the atmospheric gloominess of the setting, and her own decision to isolate give this story a feel of the gothic: unpredictable weather, isolation, and the many secrets that Lissy is hiding or not dealing with in her own life all make her and her research intriguing. And then the weird happens. Full of tension, questions, revelations and plenty of otherworldly moments, the secrets from the past are uncovered, allowing Lissy and Stefano to open up, share their own troubles and start to repair damage they’ve done to one another over the years. Transporting readers to Yorkshire with descriptions and insets that compare and contrast past with present and open possibilities for readers and Lissy alike, the mystery is more intriguing for the clues found and their interpretation and less in a ‘danger” sort of way, but no less intriguing to read or puzzle out. I didn’t find a great deal of difficulty not having read the earlier titles in the series, and am sure that fans of Ferry’s writing will be pleased to see another installment. Staying alone in the shadow of an abandoned manor house in Yorkshire would be madness to some, but art enthusiast Lissy de Luca can't wait. Lissy has her reasons for seeking isolation, and she wants to study the Staithes Group an artists commune active at the turn of the twentieth century. Lissy is fascinated by the imposing Sea Scarr Hall but the deeper she delves, the stranger things get. A lonely figure patrols the cove at night, whilst a hidden painting leads to a chilling realisation. And then there's the photograph of the girl; so beautiful she could be a mermaid ... and so familiar. As Lissy further immerses herself, she comes to an eerie conclusion: The occupants of Sea Scarr Hall are long gone, but they have a message for her and they're going to make sure she gets it. KirstyFerry is from the North East of England and won the English Heritage/Belsay Hall National Creative Writing competition in 2009. She has had articles and short stories published in various magazines, newspapers and anthologies and was also a judge in the Paws 'n' Claws 'Wild and Free' Children's Story competition in 2011 and in 2013. The Memory of Snow, her first novel, was commended in the Northern Writer's Awards, shortlisted to the top five of Wyvern's novel competition in 2011 and longlisted in the Red Telephone Novel Competition in 2012. It’s fun to have a contemporary novel deal with a historical mystery. It was an interesting parallel between the two relationships for sure.